After weeks of delay, on Thursday, January 9, Orbital Sciences Corp. launched the Cygnus space capsule on its first cargo-carrying mission to the International Space Station. Machinery breakdown, cold weather, and solar storms may have delayed the launch for a few weeks, but Cygnus safely arrived at the International Space Station three days after launch. Cygnus is a privately launched supply ship under contract from NASA. Cygnus delivered 3,000 pounds of equipment, experiments, Christmas presents, and fresh fruit for the crew. The International Space Station is currently crewed by six astronauts from Russia, the United States, and Japan. The International Space Station is a collaboration of the space agencies of United States, Russia, Europe, Japan, and Canada. This program “brings together international flight crews, multiple launch vehicles, globally distributed launch, operations, training, engineering, and development facilities; communications networks, and the international scientific research community.” The International Space Station is a complicated project because it is an international program that requires construction, support, and operation from all the space agencies and countries involved. States shall be responsible for national space activities whether carried out by governmental or non-governmental entities. 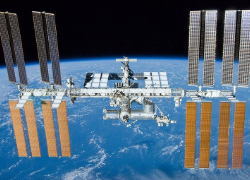 Though the International Space Station is proof that the Outer Space Treaty has been successful at maintaining peace in space even throughout the Cold War, there are still many issues that current space law is not fully equipped to address. Commercial human spaceflight, space debris, export control reform and flags of convenience are a few of the primary challenges that must be addressed in the coming years. It is expected in the next decade that private commercial human space flight will become more routine. This will lead to complicated legal issues around liability, insurance, informed consent by passengers, licensing, and safety regulations. Currently, there are as many as 600,000 objects larger than a centimeter (which are deadly at orbital velocities) in Earth’s orbit and only about 19,000 of those objects can be tracked. This creates issues around who is liable for damage caused by space debris, that there is no law of salvage in outer space, and that there are no standard operating procedures around the creation of new space debris. Currently, in the United States all military and non-military built space craft are considered defense articles and are therefore tightly restricted under the State Departments’ International Traffic in Arms Regulations. In order for the U.S. space industry to continue being leaders in the industry, there will need to be a more nuanced approach to export controls. Lastly, under the Outer Space Treaty governments retain jurisdiction over all government and non-government spacecraft. As privately operated spacecraft increase some countries may attract these private organizations with looser regulations creating “flag of convenience” issues similar to those in commercial shipping operation on the seas. The recent successful delivery of cargo by Cygnus to the International Space Station serves as a reminder of the world’s space success and potential issues. The International Space Station has been a success of international cooperation. The Outer Space Treaty has been a success in maintaining peace. However, there are new issues created by private industry and technological advancements that must be addressed that were not possible to conceive in 1967 when the Treaty was entered into force. If these issues are not addressed there is the potential for great international conflict.